Few days ago we have uploaded online demo of Agenda At Once in action. 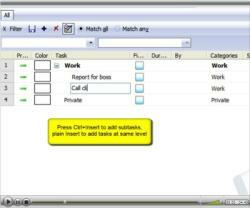 You can see how easy is to add tasks, drag and drop them to schedule and few other advanced features. Is it too long? Too detailed? Too sparse? Feel free to send us your comments. This entry was posted in Agenda At Once and tagged agenda, demo, pim, to-do on June 1, 2008 by vradmilovic. As you might now, Agenda At Once was almost completely rewritten for v3.0 and it took much more time than we expected in the first place, as beta testers would confirm. That’s why we are more than happy to see that our multi-year efforts of development went in right direction. As popularity of Agenda At Once grows, we hear more and more praise from the users, and it really means a lot. We are also glad to receive some feedback about what they are missing in AAO as it points us to the right direction for future development. One of probably most enjoyable affirmation of the hard work is when one of independent websites publishes a review, especially if it’s a positive one. That’s what happened with Agenda At Once some time ago. This entry was posted in Agenda At Once and tagged aao, gtd, pim, review on May 20, 2008 by vradmilovic. Anyway, the update is here, it’s is free for current customers and you can download this to-do list software from the usual place. This entry was posted in Agenda At Once and tagged agenda, gtd, pim on May 18, 2008 by vradmilovic.